Set in a boarding school in 1930s England, the film tells the story of a girl’s unhealthy bond with her swimming teacher which is threatened by the arrival of a new, foreign student. Miss G’s obsession for the newcomer destroys the balance in the team and the young girls decide to react. Eva plays Miss G, the charismatic swimming teacher who inspires the girls under her with her attitude and her life lessons especially about love and desire. She falls in love with the new, Italian student Fiamma who doesn’t respond to her feelings. Has a run time of 1 hour and 44 minutes. 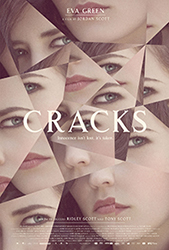 Cracks is Eva’s first film as the lone lead actor. Cracks is Eva’s second film with a Scott at the helm of the project. Ridley Scott who directed Eva in Kingdom of Heaven (2005) is the father of Jordan Scott. Cracks is the first film project that Eva shot in Ireland. This was followed by Camelot (2011) and Penny Dreadful (2014). The poem that Poppy (played by Imogen Poots) recites in the film is “Ozymandias” by Percy Bysshe Shelley. Eva and Juno Temple co-starred twice: Cracks (2009) and Sin City A Dame To Kill For (2014). They did not share any scenes in Sin City: A Dame To Kill For. Cracks is the first film where hairstylist Orla Carroll is Eva’s personal on set hairstylist. Orla has been Eva’s personal on set hairstylist ever since. Jordan Scott is the daughter of Ridley Scott, niece of Tony Scott and sister of Jake Scott. Ridley Scott is among the executive producers of the film and has directed Eva in Kingdom of Heaven (2005). The story is based on Sheila Kohler’s novel “Cracks”. The novel “Cracks” refers to a different era (1960s) and place (South Africa). The title for the French edition is “Splash”. Miss G’s costumes were borrowed from the Dior archives. Eva is a close friend of former Dior Creative Director and Designer John Galliano. Eva stated that Galliano was very kind and gracious enough to open the Dior archives for her. This is the first time Eva and Sinead Cusack worked together. The second will be in Camelot (2011).